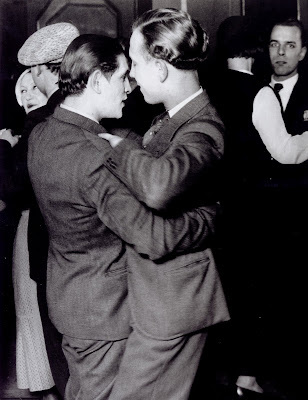 It's Friday evening and, after a couple of weeks away from it, I'm looking forward to two-stepping tonight -- even if my new favorite partner is abroad for another six days. I bought a Christmas tree this weekend. Quite a change from last year's, huh? The biggest difference, not only from that tree but also from any other I've had in my life: I put tinsel on it. 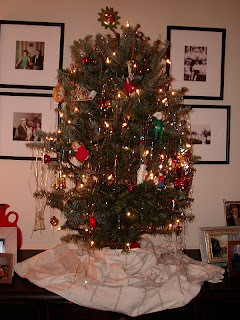 Once, I came across a photo of my parents' first Christmas trees in the 1950s, before they had kids; there was the same "icicle"-style tinsel on it that I have now. It was sort of like discovering that one of them had had an illegitimate child. Perhaps -- as I've often realized over the years in other matters -- the strictures, prejudices, or prohibitions that I'd imagined never actually existed at all. Maybe all I ever needed to do was simply utter the word: "tinsel." And it would be mine. As I sat here at my desk tonight, a series of thoughts led me to remember that the second anniversary of this blog was two days ago. Then, as writer Faye Moskowitz says in one of my favorite essay collections, "the memory chain began to slip again . . ." and I was reminded of another almost-anniversary: a post I wrote here just shy of one year ago. The song I wrote about on December 19, 2006 -- Raul Malo's version of "Feels Like Home" -- still moves me as strongly as ever. In fact, I just listened to it again after rereading the post. I now own the home that on December 19 was still only a longing. I didn't know then that I'd see it for the first time ten days later -- and make an offer on it two days after that, New Year's Eve. And that other feeling that was awakened as I listened to Raul Malo's voice a year ago? I tucked it away for safekeeping, like a crinkly letter from the past, glad to know it wasn't lost anymore but wary of taking it out of its drawer again, as if it would crumble in my hands, or blow away with a draft. It turns out it may not be an old letter after all but the start of a story.